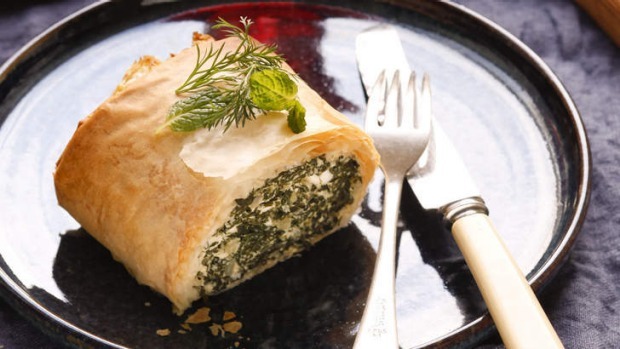 This sort-of-spanakopita (spinach pie), is even more delicious made with silverbeet instead of spinach, with ricotta as well as fetta, and with mint and dill. Serve with roasted tomatoes or home-made tomato sauce. Heat oven to 190C. Wash and roughly chop silverbeet leaves, finely chop any stalks. Cook in simmering salted water for five minutes or until tender, then drain well and cool. Squeeze out excess moisture. In a big bowl, mash fetta with ricotta. Add grated nutmeg, lemon juice, oregano, dill, mint, salt and a generous amount of pepper. Add eggs and cooked silverbeet, mixing well. Lightly brush a sheet of filo pastry with oil, place a second sheet on top, brush again, and continue until you have six oiled sheets. Form filling into a log shape along the long edge of the pastry. Roll it up to seal, tucking in the ends as you go. Place on a baking tray lined with baking paper, and brush with remaining oil. Bake for 40 minutes until golden. Rest for 10 minutes, then cut into slices and serve with a little extra mint and dill.